Today we are launching our popular doubleTwist AirPlay Recorder on the Mac, bringing Mac users the ability to save iTunes radio streams for offline playback. 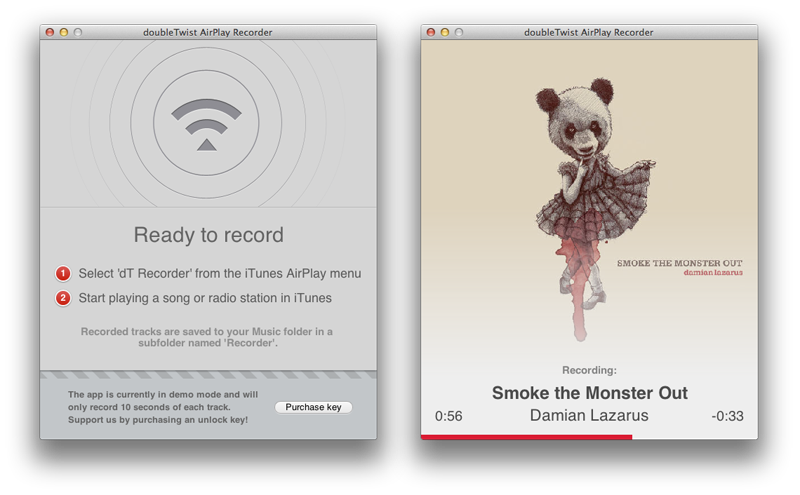 doubleTwist AirPlay Recorder is easy to use and appears as an AirPlay device in iTunes. Recorded audio is saved to your music folder under “Recorder”. You can record 10 sec samples for free, or upgrade to the full version for $9.99. Download doubleTwist AirPlay Recorder for Mac (requires Mac OS X 10.7.3 or higher). doubleTwist apps are handcrafted with ❤ in San Francisco.